The Book Chook: Children’s Book Review, How Did I Get Here? Children’s Book Review, How Did I Get Here? How Did I Get Here? is a children’s picture book written and illustrated by Philip Bunting and published by Omnibus for Scholastic (2018.) RRP: $Au 24.99 HB. I have previously reviewed many Philip Bunting books, including Mopoke, and Kookaburras Love to Laugh. In my latest Bunting review of his book, Sandcastle, I write that: “there is less humour in this latest book I think, with the author instead choosing to weave in a comment about the ebb and flow of life and the universe.” In How Did I Get Here? we see similar big themes. Luckily there is still Bunting’s trademark humour evident in both the words and the illustrations. I think kids 6+ will both enjoy AND learn from this factual book. Isn’t that the best kind of book? In language written for kids, Bunting takes the reader from the Big Bang through the formation of planets and early life forms to the advent of humans. That early life form? “…you can think of her as your great, great, great - times a trillion, zillion, squillion - granny”. 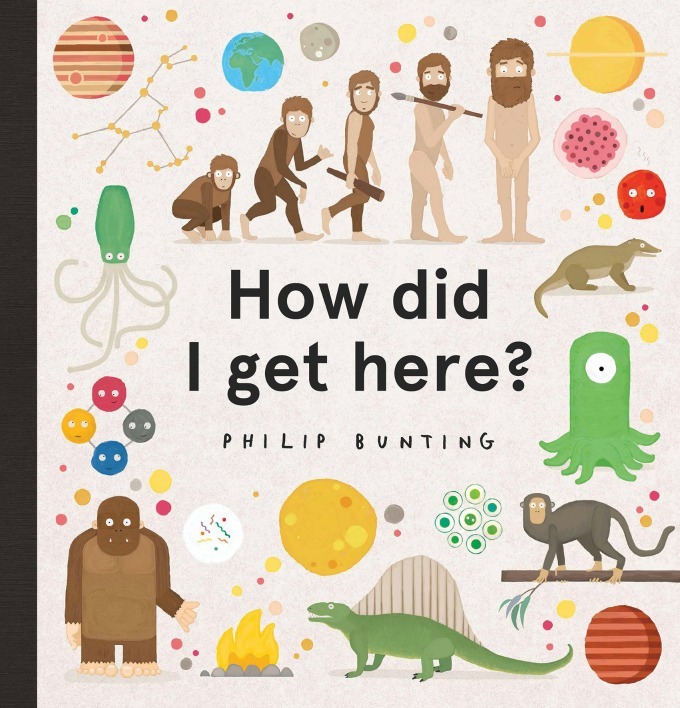 All this accompanied by Bunting’s appealing and humorous illustrations - early man has a speech bubble asking, “How me get here?” The final double page encourages kids to muse over what else might have happened if humans hadn’t evolved. I predict lots of discussion, writing and drawing will occur after sharing How Did I Get Here? and recommend it to families and libraries everywhere.